Cleveland, OH (April 2018) – When Danelle Daniels moved to Cleveland, she didn’t anticipate a housewarming gift worth thousands of dollars. 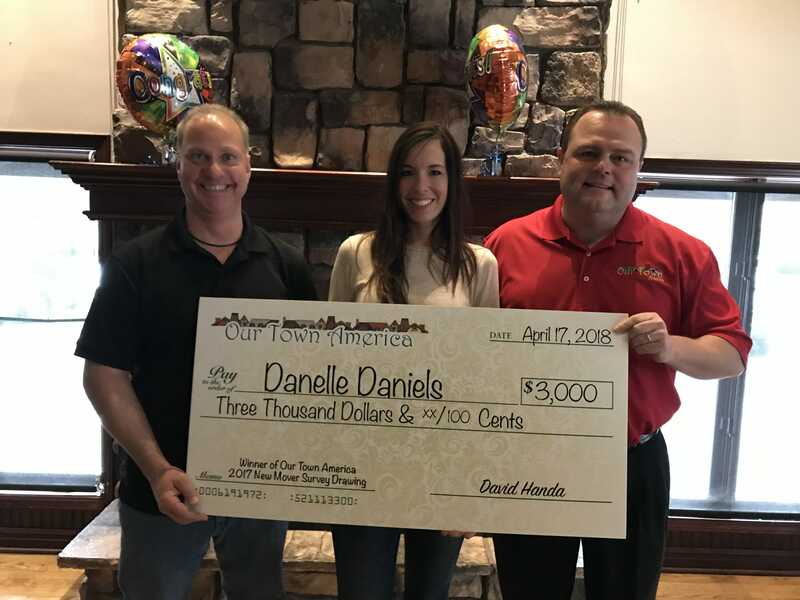 On Tuesday, the Cleveland-based franchise owner of Our Town America, the nation’s leading new mover marketing company, presented Daniels with a $3,000 check after naming her the grand prize winner of our 2017 National New Mover Survey. Daniels was one of the thousands of new movers across the country to complete the annual survey included in the Our Town America welcoming package — a personalized collection of free offers from local businesses, like Cleveland’s Rivals Sports Grille where Daniels received a giant oversized check for $3,000. A New Mover gift certificate led Daniels to the friendly neighborhood bar, and now Rivals Sports Grille has become one of her favorite new restaurants. Owner John Simmons says he enjoys connecting with new residents like Daniels through the Welcome Package— it’s one of many reasons he relies on Our Town America to introduce his business to Cleveland’s growing community. No word yet on how Daniels will spend her winnings, but she can of course spend the $3,000 to buy additional goods and services from local businesses! Dave Handa with Our Town America says the New Mover Survey is an excellent opportunity for local businesses and newcomers to Cleveland. "Moving was a huge step for my son and I, I'm thankful for the Our Town America package, because it helped during our busy transition. Thank you for caring and making us feel welcome," said Daniels. Cleveland-area businesses interested in the Our Town America program can complete a Contact Form or call franchise owner Dave Handa at 440-376-1254. For more information on the annual New Mover Survey, we invite you to explore our website. Want to see who the 2016 winner was? Click Here.